X-Arcade has released their gamepad for pre-order now, shipping on December 1st. The joystick functions with PC, Mac and Linux with a USB cable as part of the package, but can operate on a selection of gaming consoles for an addtional price. This 12 pounds of gamepad comes with a lifetime warranty and boasts itself as "the most versatile and authentic joystick available." The company suggests that this joystick will be unbreakable with special American-designed parts. For those in the UK, the base price of $99 (around £64) is lifted up with the international shipping price of an additional $99 bringing the total to around £128. If you include an optional extra adapter, prices come between $9.99 and $99.99 depending if you want support for all 9 systems available. The systems compatible with the joystick are Xbox 360, PS3, Wii U, Wii, PS2, PS1, GameCube, Dreamcast and Xbox. 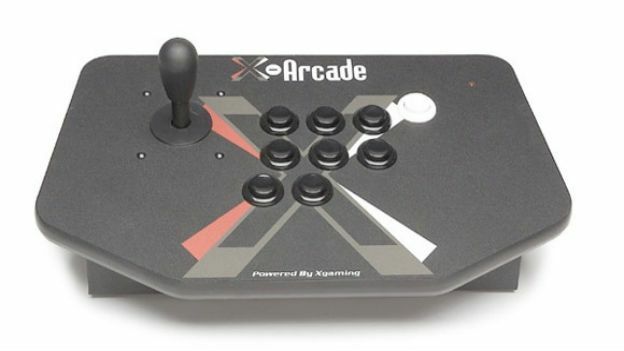 The X-Arcade solo joystick comes with computer-only support as standard for PC, Mac and Linux. Last month an image of a Logitech game controller for Apple's iPhone 5 was leaked online with four buttons and a joystick.